Preheat a char-grill pan over medium heat. Place the oil, oregano, garlic, salt, pepper and chicken in a large bowl and toss to coat. Cook the chicken for 6–8 minutes each side or until cooked through. Slice and keep warm. To make the pesto dressing, place the pesto, lemon juice and water in a medium bowl and stir to combine. Place the zucchini, olive, rocket, beans and half the basil in a large bowl and toss to combine. 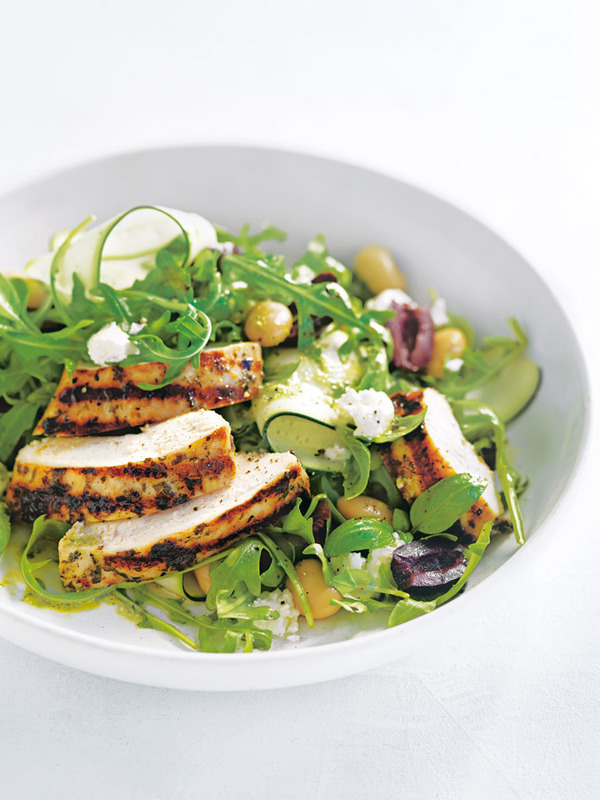 Divide the salad and chicken between bowls. Top with the dressing, cheese and remaining basil to serve. Serves 4.